Heat oven to 350°F. 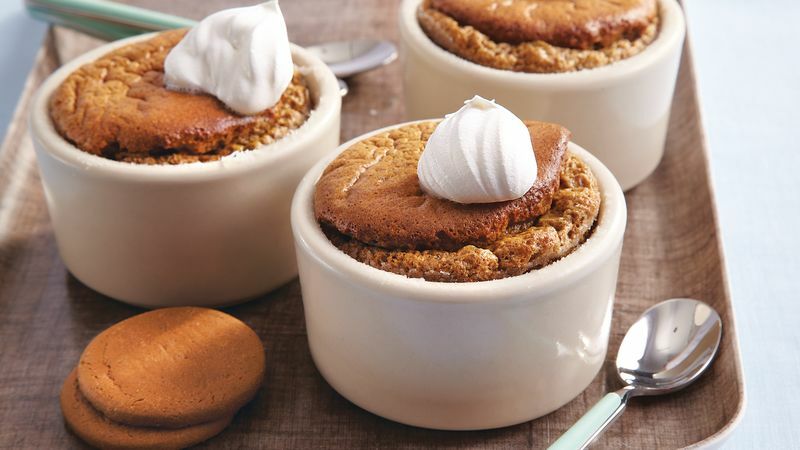 Butter 10 (7-oz) ramekins; sprinkle with sugar to coat and shake out excess. Place ramekins on large baking sheet. In 2-quart saucepan, stir together milk, 1/2 cup sugar, the flour and salt with whisk until smooth. Heat to boiling over medium heat, stirring constantly. Pour mixture into large bowl; stir in molasses, 2 tablespoons butter, the pumpkin pie spice, ginger and vanilla. Cool 15 minutes. Beat in egg yolks with whisk. In medium bowl, beat egg whites and cream of tartar with electric mixer on high speed until stiff peaks form. Fold egg white mixture, one-third at a time, into milk mixture until well blended. Spoon batter into ramekins, leaving 3/4-inch space at top of each. Bake 25 minutes or until puffed and set. Serve immediately. Garnish with whipped cream.